S is for Sawyer, Robert Sawyer. 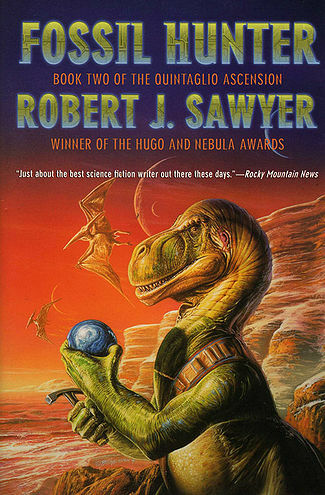 Robert J. Sawyer is one of the six nominees for the 2010 Hugo Award in the Best Novel category for "Wake." Not darkness, for that implies an understanding of light. Not silence, for that suggests a familiarity with sound. Nothing more than that. Just awareness - a vague, ethereal sense of being. Makes me want to go out and buy "Wake" right now. Wake is book one in the WWW trilogy: Wake, Watch, and Wonder. The first two are available now and you can read first chapter excerpts on the www trilogy web site. Sawyer, born April 29, 2010 in Ottawa Canada, sold his first short science fiction story in 1979 to the Strasenburgh Planetarium which they produced as part of a dramatic starshow trilogy called "Futurescapes" in 1980. While attending Ryerson University and working on his Bachelor of Applied Arts in Radio and Television Arts, he had his first story published in Ryerson's 1980 Literary Annual - White Wall Review. The story "The Contest" was included in the anthology 100 Great Fantasy Short Stories released in 1984. After graduating from Ryerson, he spent the next six years writing mainly non fiction freelance articles for various American and Canadian magazines. His true love however was writing science fiction and he decided to concentrate on writing novels full time. The story is unique in that is it told from the viewpoint of the Starcology Argo's ship's computer, Jason. One of the ship's crew is murdered and the finger points straight at the artificially intelligent computer. 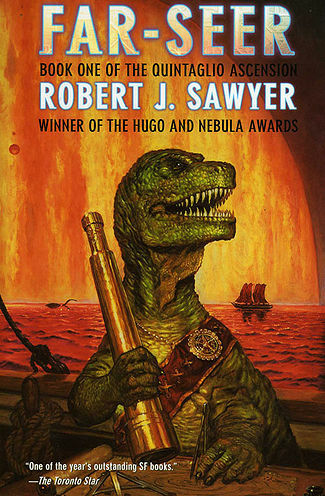 After that he wrote Farseer, book 1 in the Quintaglio Ascension series which revolved around the world of a group of intelligent dinosaurs. His next book, End of an Era continued with the dinosaur theme but took us back through time travel to the beginning of the world to find out what really happened to the dinosaurs. Sawyer explored many interesting themes in his books including SETI, artificial intelligence, time travel, dinosaurs, psychology, murder and the nature of consciousness to name a few. 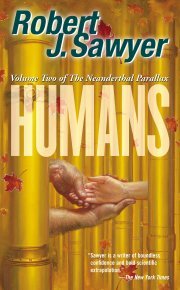 In his Neanderthal Parallax series, he explored the question: what would have happened if there was another world in which the neanderthals have survived and became the dominant species. How would their world differ from ours? 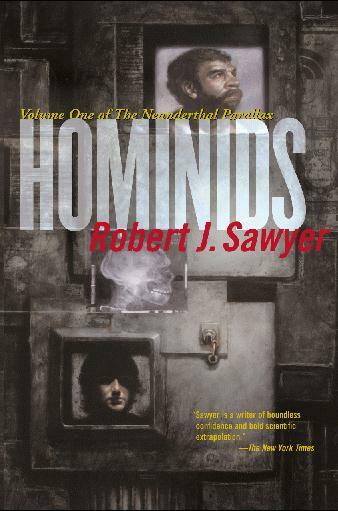 He won the 2003 Hugo award for Hominids. In his next standalone book, he went on to explore in Mindscan what would happen if in order to avoid suffering an inherited debilitation disease that would turn you into a vegetable, if you could have your mind scanned and assume an android body while your body is shipped off to the moon. Would the people you know accept you? If a cure was discovered, could you be scanned back into your body? Which brings us to his WWW trilogy. WWW.Watch was just released on April 6th and continues Caitlin's story from WWW.Wake. He is currently working on Wonder and I'm not sure when it will be released. 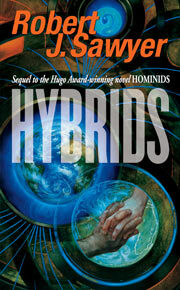 I have a mini challenge for you all - read all six hugo nominees this year. 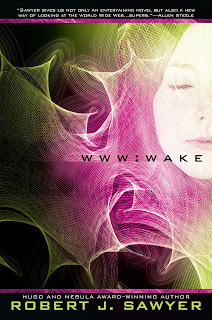 I'm looking forward to reading WWW.Wake as *gasp* I haven't read any of his books yet. This is the fourth review I've done in a couple of days. Had been reading a lot and now blogging a lot. Please feel free to peruse what's been happening at "Review, Rewrite, and Rewind" http://52annualbookreviews.blogspot.com Trying to keep up with 52 books in 52 weeks is tough!